Description: The Alpha Simulation D model Phantom rebuilt for FSX and P3D. 1. True FSX native modeling, converted to FSX using ARNO’s MDLX program. 4. Allpaints are in DDS format. 6. New air configuration file. 7. New HD VC textures. 10. Default and custom GPS. 11. FSX coded gauges and sub panels. A collaboration created by the following flight simulation artist Antonio Diaz, Cirrus N210MS, Tim Conrad and David Robles. Sounds tied to Dino Cattaneo’s F-14 Tomcat. Benton IL. U.S.A. Ilive in country with 70 acres. That's a pretty bold statement considering the amount of work that went into the Milviz F4. Yes IYHO it maybe the case, but also remember that Milviz produces some amazing AC including the F4 which in my own opinion is the current benchmark F4 until DCS produces one. Cloud9 is still a nice model to. The work on the Alphasim model is exceptional and gives simmers a freeware option if they are short on cash, but to state its a better flyer/better looking is a matter of taste. Milviz is a groundbreaking payware model and to compare it to an updated 2005 model by saying its a better flyer/ better looking is pretty much ignorant. Your intentional comment is rude. Let's show all developers the respect they deserve when it comes to they're own models. I applaud David Robles and the other team members for updating the Alphasim model and I to am flying it, but lets also try to appreciate other developers like Milviz for continuing to provide our community with amazing new AC. Great job, Dave. Kudos to you and anyone else involved in this project. I would very much like to have an F-4 in my P3D V4 but so far I can't get it to work. None of the variants show up in the P3D aircraft list and if the I try to start the sim anyway I get a CTD. I'll keep trying but so far no luck. I do appreciate all the work that must have gone into this machine. 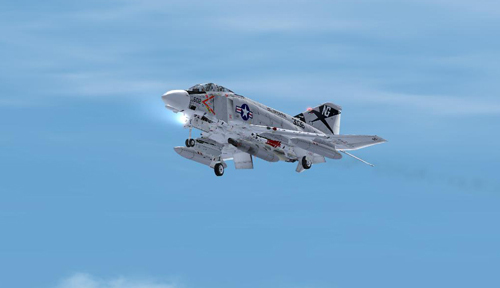 Best freeware Phantom for FSX! Thanks for this one Guys! Maybe a E model? I am using it with success in P3Dv4.2. True, it does not display in the selection menu, but at least for me when I select one livery or another it shows up and flies beautifully and displays well in the sim. Unfortunately, I haven't a clue why it would work for some and not others. Perhaps someone with more technical knowledge could provide some suggestions. I also want to say a big thanks for this model. I have lamented not having a good F4 to fly in P3Dv4 and this more than fills the bill for my needs. I can't get any of the variants to show up in the aircraft menu no matter how many times I move through the selections and in my case the CTD was almost immediate - no playing around while P3D thought about it - just crash - makes me a little hesitant to try it again but I really would like to have a Phantom in the sim. So everyone is supposed to respect Milviz, but its ok for you to run you mouth and call another member names!?! Who the hell are you to talk!! We have enough 'Milviz' conflict in other forums. Enjoy Dave's work and ignore the troll. Tacpack update available at IS4G. I am sure its great, but its not P3D v4 compatible. Many thanks for this. I've been hoping someone would take this on. I seem to be having a bit of an issue with it in FSX/SE. In external view I'm missing some parts in the cockpit. Anyone else see this? An FSX -vs- P3D issue maybe? Try the Tacpack Update linked above; even if you don't have tacpack that should fix it. Thanks very much for this plane, David! Especially the "dirty" textures. They bring back a LOT of memories. Some really great, some, well, maybe not so great. I still appreciate the effort it took to bring us this wonderful plane. The model update fixed my display issue. Thanks again. Another question: Since I don't have TP is it possible to manually edit the cfg to show any weps on the pylons? AIM-9s would be awesome. Again thanks. I really like this old bird. Got it this morning, David (if you are still here ) Flies fine, looks great! Requires a few mods; I'll have a look at what can be done. Yes, kinda too bad the drag chute doesn't work. I miss seeing it taxi up to the flight-line with the chute draped over the left wing. Still and all, great plane. Flies wonderfully. Fine example of the "Put enough power behind a brick and it'll fly!" principle. I still love the Phunky Phantom, though. Thanks very much to all involved!